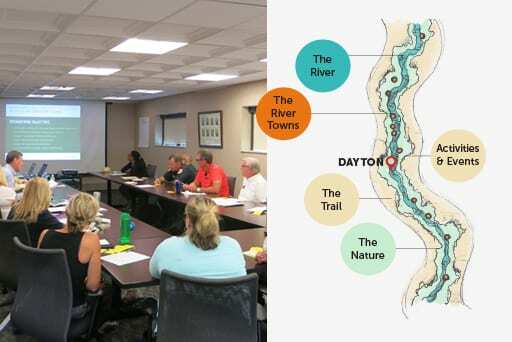 The Great Miami River corridor is 99 miles of interconnected waterways and trails that stream through 15 cities in southwest Ohio. Rich in recreational opportunities, public parks, entertainment venues and businesses, the corridor is a destination for all types of outdoor and urban enthusiasts. The Great Miami River corridor is a series of interconnected waterways and trails. While the corridor represents strong opportunities for growth, tourism and community-building, it is under-utilized and largely unrecognized as an accessible resource. After a yearlong study by the Army Corps of Engineers’, the recommendation was to create a well-articulated, unified brand identity to help drive economic returns that would further revitalize and grow the corridor. This effort is led by the Miami Conservancy District (MCD) with support from various stakeholders. Guide Studio collaborated with a group of community stakeholders – including cities, organizations and businesses along the corridor – to create an honest, forward-looking positioning statement as a solid platform for selecting a name, logo and other visual components to tell the brand story. A consensus-based process was led to arrive at a brand name, The Great Miami Riverway, and logo. A robust brand launch plan maps out milestones and activities that community leaders will activate. Key stakeholders were engaged in Brand Champion training to generate excitement and develop a shared understanding and go-forward plan for various entities to support marketing the newly branded area.